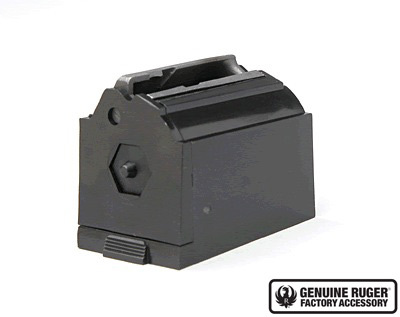 9-Round, 22 WMR, 17 HMR Caliber Magazine with Steel Feed - Black Plastic. Fits the Ruger® 77/17®, 77/22® WMR, and American Rimfire® *Due to changes in the law effective October 1, 2013 Ruger is not able to sell magazines to CONNECTICUT residents. Ruger cannot bill to or ship this magazine to Brooklyn, Buffalo, New York City, or Rochester, New York. DO NOT ORDER THIS PRODUCT if you live in these cities. Love the mag concept with this and the 10-22 style rifles. Agree with the first review with suggestion of a greater capacity mag with the American 22 WMR. Extended like the banana style but say in a 15 rounder?? Just a thought. 9-round mag is good - larger capacity wound be GREAT. Have 3 9-rd mag. Never a problem. However would love to buy RUGER brand mag in a 20 or 25 rd mag for my 22 magnum rifle. Of all my rimfires, this and the 10-22 mag are the most reliable. I use three of these in my American Rimfire 22wmr and .17hmr. They never let me down.